We’re changing the way we light out world. From simple energy-saving upgrades in flashlights to homes fixtures, to larger ticket items, including stage and architectural lighting, as well as the lights we see as we drive down the roadway. This, of course, includes commercial signage. The next time you have a bulb burn out, or need to make a change to your commercial signage, may be the perfect time to covert your signage to LED. 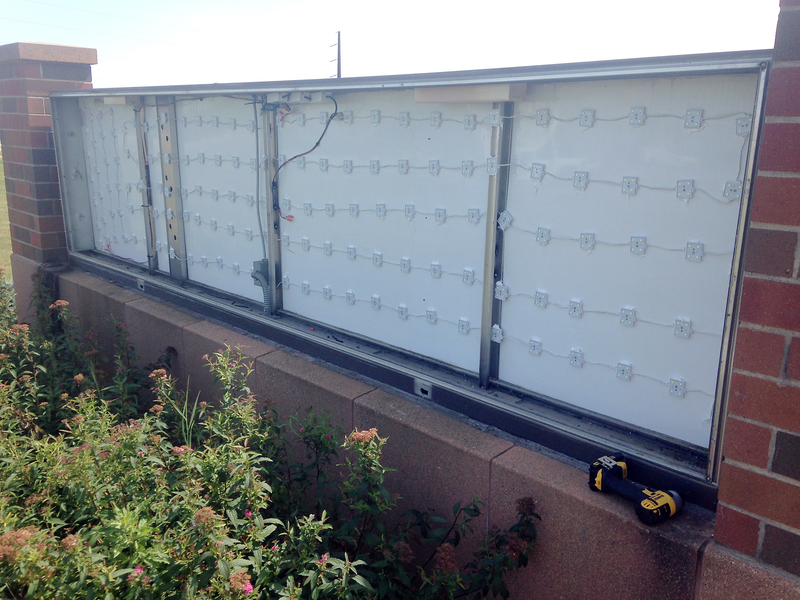 An array of LED modules replace the florescent bulbs in the City of Lakeville’s illuminated sign. The maintenance on your sign decreases dramatically once converted to LED lights. LED won’t flicker, burn out significantly less often, and produce consistent light throughout their life cycle, which can exceed 50,000 hours. The obvious savings with LED conversions is the energy savings, but for a business, the largest savings can come from the maintenance of the sign. 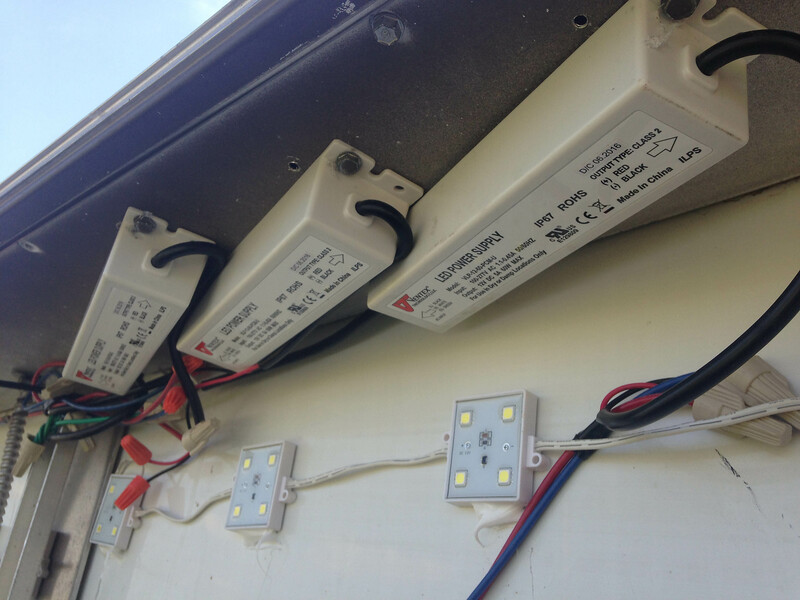 While the cost of a florescent bulb may be minimal, the cost to have them replaced can add up, especially when those bulbs are located inside pylon signs high off the ground. Difficult to access and hard to reach, the bill for replacing a bulb, which can happen more than once a year, adds up quickly. Reliable power supplies replace troublesome florescent ballasts in LED installations. LEDs also replace the need for ballasts – a requirement for all florescent lighting as well as other commercial and industrial bulbs, such as mercury vapor lighting. The contain zero mercury (safer for the environment) and are shatterproof. Since they emit almost no heat, there’s no need for glass, which is also more likely to break during transit and installation. As the prices for LEDs come down, so do the options. LED conversions come now in as many forms as incandescent bulbs – from modules to fit inside channel letters and other custom sizes, to simpler conversion bulbs that, with proper rewiring, fit into existing florescent fixtures. 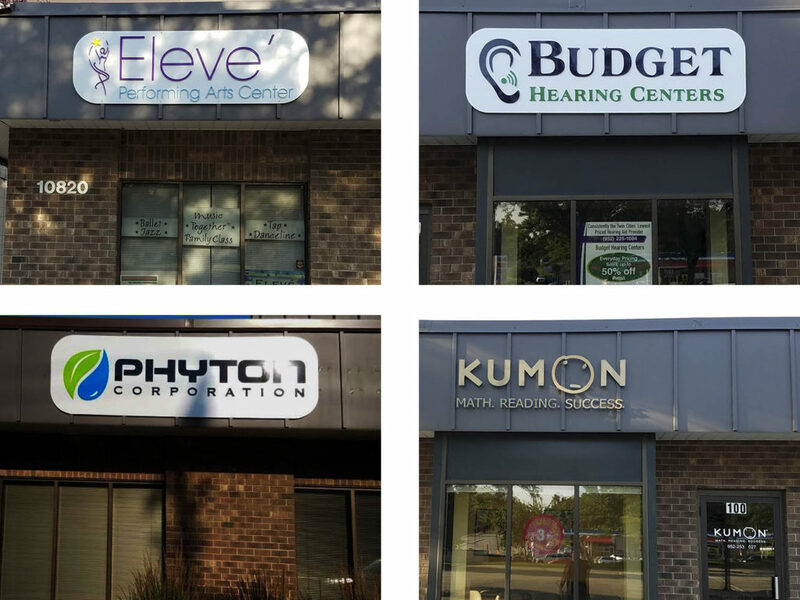 Precision Signs & Imaging is doing more and more LED conversions, and, as previously mentioned, most businesses and business park owners choose to upgrade their sign when other changes are needed. 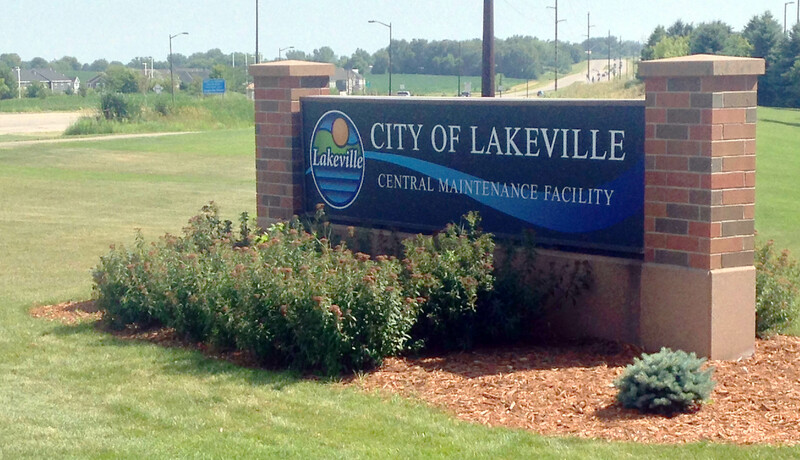 This July we’ve performed LED conversions to a large sign at the Lakeville Central Maintenance Facility during a sign refacing, as well as a similar project at Lakeville Liquors at County Road 42 and Interstate 35. We look forward to consulting you on your LED conversion as well. Give us a call at 952-595-5678 to find out more. We get lots of calls for all kinds of vehicle wraps. 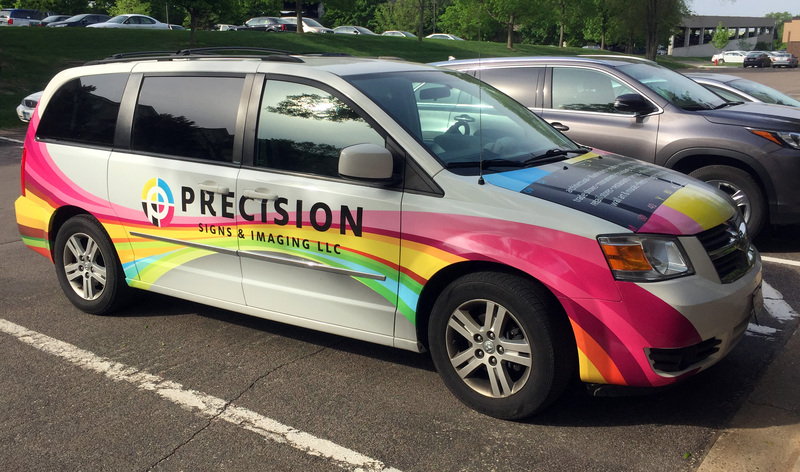 Color changes, custom graphics, business promotion – these are all great reasons to consider a vehicle wrap using vinyl product. Vinyl offers the option to do anything you can imagine, and produce holographic and metal effects that can be costly or difficult to produce with standard paint jobs. 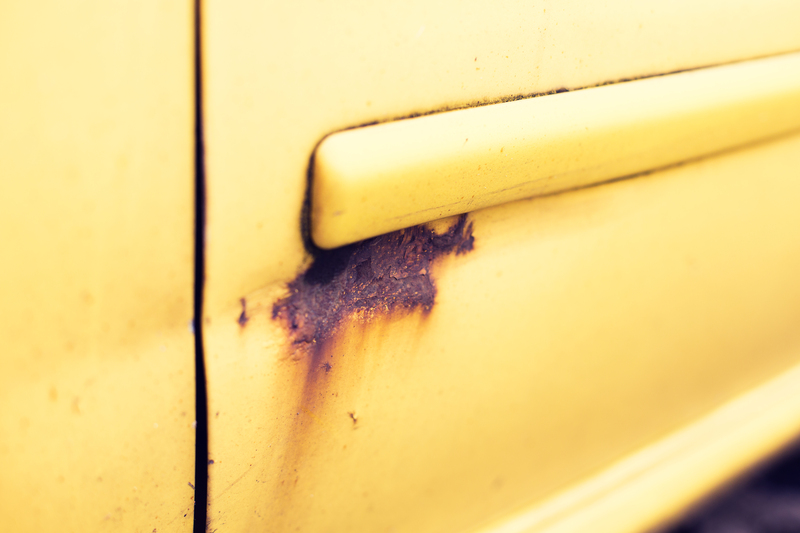 We also get call for people wanting to “restore” a vehicle with a vinyl wrap. We’re just going to put it out there – vinyl isn’t duct tape. If you’re looking to fix a failing paint job with a vinyl wrap, it’s just not going to work. If the paint’s not sticking, the vinyl on that paint isn’t going to stick either. 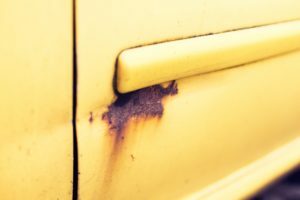 Vinyl’s not going to stick to rust either. It’s going to install poorly perform poorly and look unprofessional. Vinyl wraps remain an great option for doing something truly unique. From doing things paint simply can’t do, from custom professional graphics to metallic and reflective materials that are simply out of this world. Office building complexes often have Uniform Sign Design or (USD) to ensure that no one tenet oversteps their bounds with signs that don’t meet the wishes of the building owner. 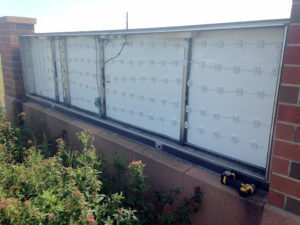 A USD instructs the business owner if they can have illuminated or non-illuminated letters, if it is acceptable to have your letters on a raceway or if they must be directly connected to the building, or if a sign can contain graphics or just text. As time passes and technology changes the USD may just be the thing that needs to change with the sign of the times. This is the case with the Minnesota Valley Building located at 10800 Normadale Blvd., in Bloomington, Minnesota. The old USD written in the 1970s called for only dimensional letters, mounted individually on standoffs with a height not to exceed 12 inches. The only choice of color was a dark gold which caused the letters to blend into the dark brown awning from any viewable distance. Recently a new tenet moved into the complex and made note to the building owner that he didn’t want to waste money on a sign since the current USD only allowed letters not visible from the street. This defeats the purpose of a sign, which is to inform and direct potential clients to your location. We held meetings with the building owner and the Bloomington City Permitting Office. 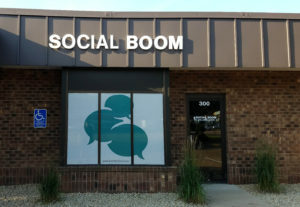 With the client’s needs taken into consideration, the USD was changed to allow dimensional letters in a variety of colors to be mounted to three-millimeter white bi-bond panels to allow for greater contrast and visibility. 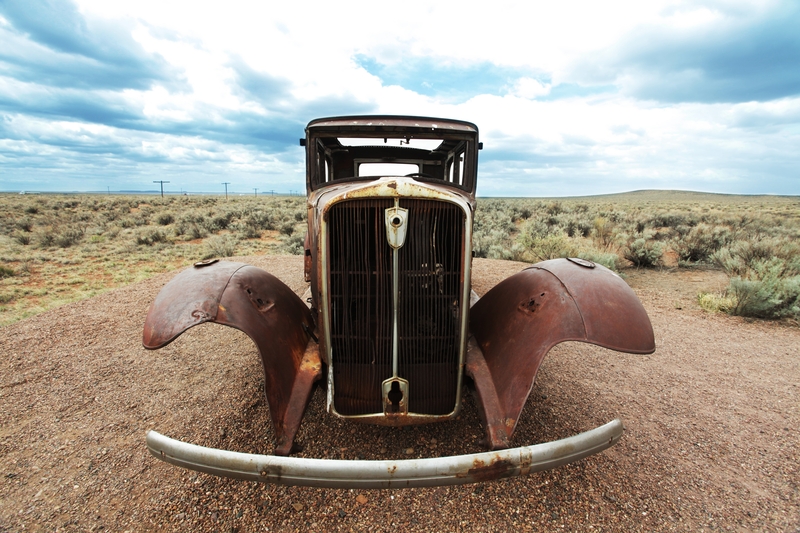 Sometimes a facelift is just what is needed to help your business succeed. We’re willing to help you change the rules to make that happen. A sign you can’t see is just as good as no sign, and after all, a business with no sign, is a sign of no business. 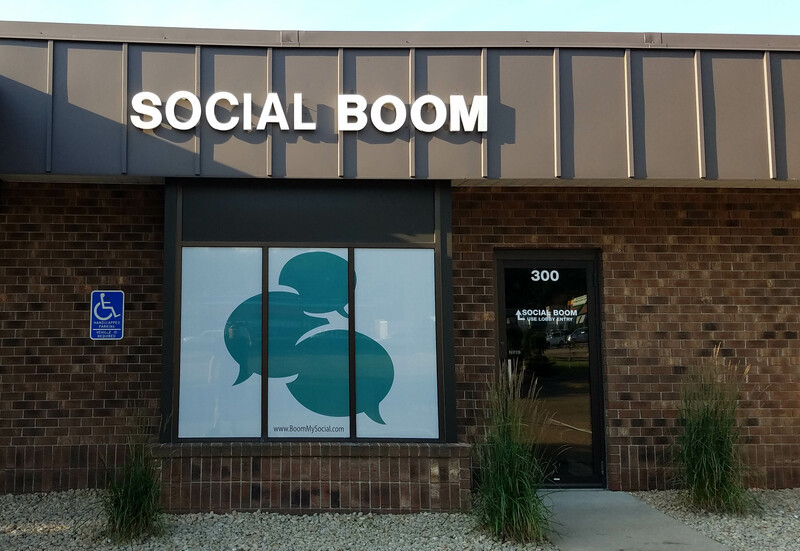 Precision Signs and Imaging, LLC, completed a recent quick custom install for one of our neighbors in Burnsville, Minnesota. 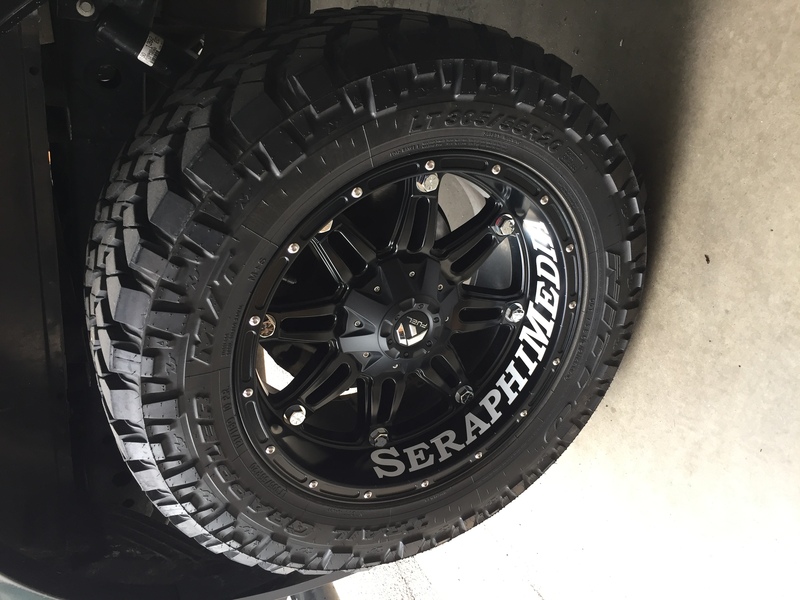 Vince Whoehrie came up with the unique placing for the vinyl letter install of his SeraphaMedia logos – inside the upgrade rims of his custom Ford F150 pickup. Mitch was familiar with vinyl decal, advertising his roofing and siding work with door signs on his truck. Kathy Armstrong, designer and sales manager, worked with Mitch to fabricate the design. She worked up the vehicle graphics to promote his YouTube channel, which we custom cut on white vinyl. Mitch brought his truck by Friday and Chris Rocco, art director, and Jeremy Gaston, our newest designer, tackled the interesting sign install location. Mitch left happy with his new logos. Keep an eye out for his black truck around Burnsville, and check out the custom logos inside his rims if you’re parked next to him or see him at a stoplight. And keep thinking of interesting ways to promote your company. We’ll be glad to help. Vehicle lettering, decals and wraps, either partial or complete, are a big part of the sign inventory at Precision Signs & Imaging. Vehicle advertising puts your company’s image and information directly on the street. That annoying stop light just turned into an opportunity to tell the vehicles around you what you do, and you don’t even have to turn down your music. “The best thing about a vehicle w rap is that it’s free advertising wherever you go,” said Rocco, art director for Precision Signs & Imaging. While the mobile advertising is free, the cost on an install breaks down into a few areas. The first is design. 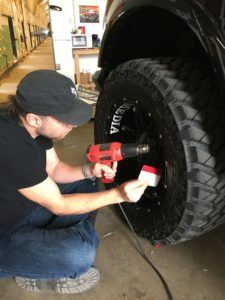 When a customer contacts us about a vehicle wrap, their idea of what that means can vary greatly, from a few decals spread around the body, to covering much of the body. We work with customers to determine the best solution for their case. In the design process, we work with templates for specified vehicles, then layout and develop plans for installation. We follow up with printing the graphic on a variety of stocks, from good to best quality material, including a range of vinyl products from 3M and Avery. The final step is installation, usually performed by a two-person team. This can take several hours to a full day, depending on the size and complexity of the vehicle. Precision Signs & Imaging completed two vehicle wrap installations last week, covering the signs of our work can with full length decals to match the already covered hood. The install was completed May 9 in our shop. 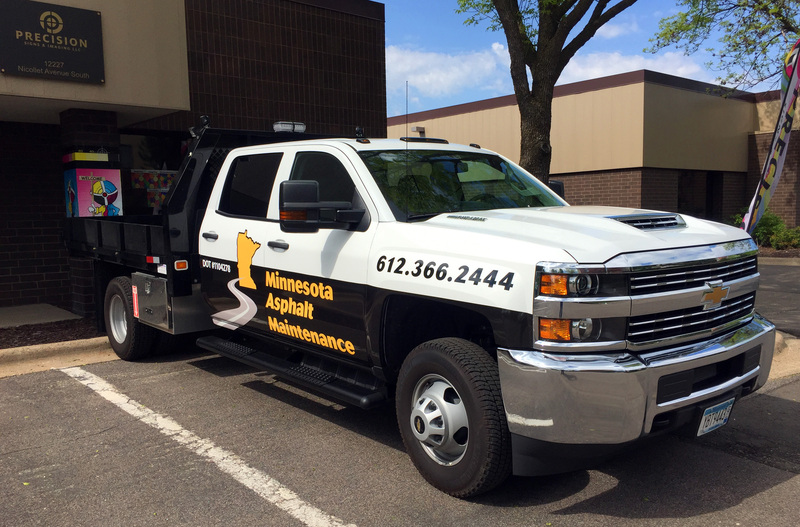 On Thursday and Friday, we completed the side running vinyl graphics for Minnesota Asphalt Maintenance on a new Chevy Silverado 3500 work truck, complete with custom graphics, company phone number and two-inch DOT numbers. I am often amazed when I speak to people about signage at how many people think of a sign as a post in the ground with a sign face nailed to it. Sure, that’s a sign but there is so much more to signage than this traditional image that pops into our heads. The world of signage is expansive and incredibly diverse so I wanted to take a moment to talk about some of the outstanding products we make that one doesn’t think of as being ‘signs’. Flag banners: These come in a variety of shapes and sizes and there are bases available for sitting on hard surfaces, sticking into the grass or gravel, or even to hold down under a car tire. Their unique shapes and use of wind to create movement make them a popular choice for drawing the attention of all kinds of traffic from a distance. The most popular shape for these is the teardrop-shaped banner, however they can be made round, square, triangular, or whatever you wish. 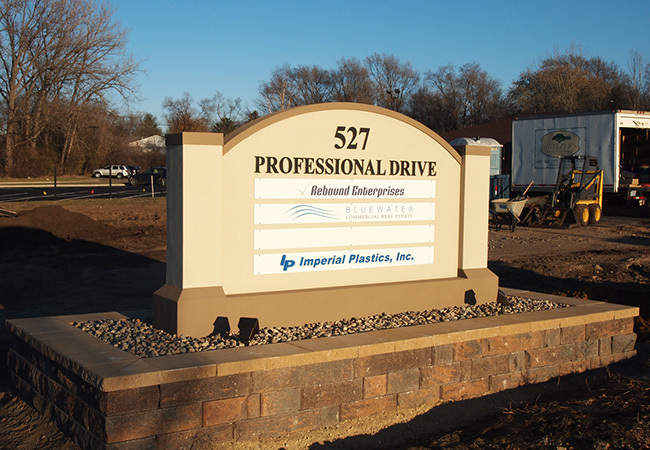 Monument signs: Large buildings and buildings with many tenants often like to employ monument signs to tell the public where they are and they come in just about every shape, size and style you can think of. Some are made of masonry or wood, but recent years have seen the rise of foamcraft monuments which simulate these materials with incredible realism. These foam-formed monuments are painted to look just like the real thing but do not require the structural foundation of real masonry because they are much lighter. They also are made to withstand powerful winds and all types of weather, typically at a fraction of the cost of real masonry. Vehicle wraps are one of the most cost-efficient ways to advertise and, when done right, have a head-turning effect that can’t be matched. Vehicle graphics: A sign on a vehicle? Sure thing! 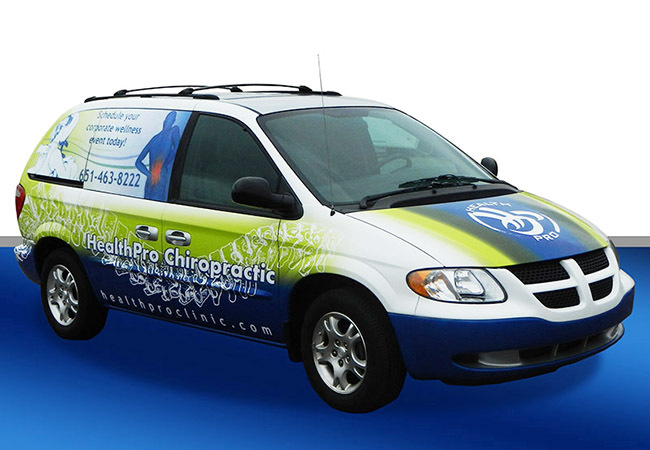 Vehicle wraps offer the biggest bang-for-the-buck of any type of signage because of their unique eye-catching nature. A full car wrap or truck wrap is hard to ignore driving down the road or parked in front of a business, but there are options for smaller budgets that work well too. These could include truck door and tailgate lettering, partial wraps, spot location graphics, door magnets or perforated window graphics. Electronic message centers (EMC): Some of the most dynamic and versatile signs in the world are today’s full-color LED message centers. 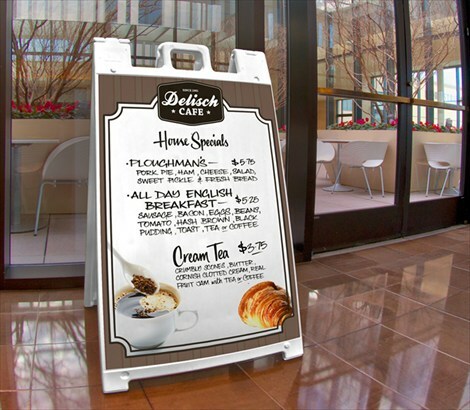 They can be made in a variety of sizes and shapes and can feature full color text or graphics which can be programmed to change like a slideshow. Some even feature animation and sound, so the possiblities are endless with these powerful advertising tools. They can be mounted to a building, integrated into a monument sign or lighted sign cabinet, installed into a scoreboard, made into a roadside billboard or even just stand alone. Signicades: The traditional A-frame sign has been used by shop owners for just about as long as signs have existed, but today’s signicades take the concept to the next level. These are made of a durable plastic which can have graphics changed in and out at will and reused over and over again. They come in all sizes from tabletop to gigantic and can be filled with water or sand to keep them from blowing over. Wood, cement, brick, and may types of painted surfaces can feature massive wall murals like this. Wall graphics: Some people look at a wall and just see a wall. I look at a wall and see a blank canvas! Put spaces like walls, windows and even floors to work for you promoting whatever message you wish. Today’s materials are amazing and can adhere to a wide variety of surfaces- even textured surfaces like brick! 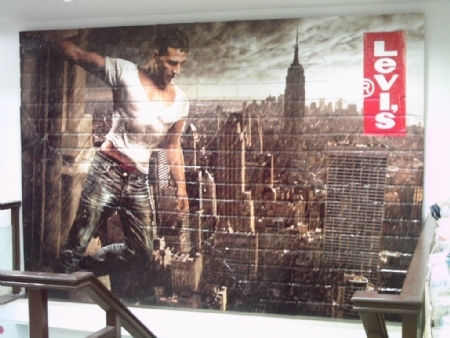 These murals can stretch down a hallway or mark/promote products on display in a P.O.P. setting. Direct traffic by putting floor graphics down which tell folks where to go, or simply use it as a way to put beautiful full-color imagery on a wall as part of your interior design plan. It doesn’t stop there- I could keep redefining the word ‘sign’ all day long! 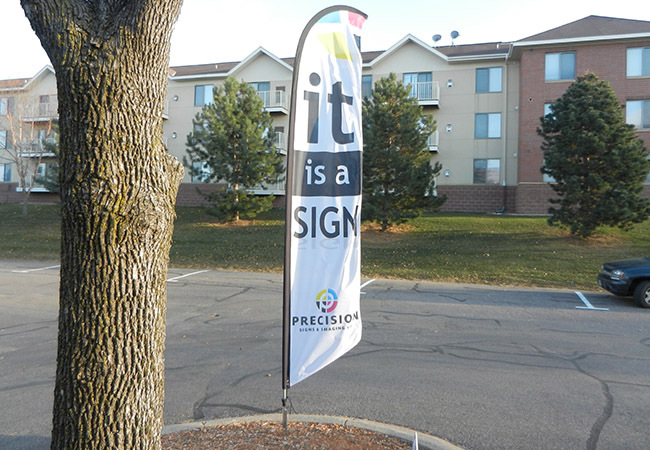 We could talk about giant trade show walls that collapse into a tiny travel case, 3D routed signs that jump out at the viewer, signs with programmed lighting displays and more- but the best way to learn about what sign is right for you is to contact the professionals at Precision Signs & Imaging. We have all the latest technology as well as the design ability and vision to help you make the most of it. Accurate color in digital printing is something I’ve been passionate about for years. I’ve taught classes on it, trained numerous people in it and have done countless hours of testing and experimentation with printers of all types. Because accurate color should be expected wherever you do your printing, yet so often print service providers neglect it. When John Swaney gave me the opportunity to head-up his printing operation here at Precision Signs & Imaging, one of the things I was most excited about and that we both agreed upon was that our color capabilities had to be outstanding. Heck, “precision” is in the name of the company so we had to be able to hit colors! Today I decided to write a bit about color science and how perfect color is achieved from the perspective of a self-proclaimed color nerd. I put a lot of work into making sure our equipment produces tremendous color, but it doesn’t end there. I not only want my prints to look amazing, I want them to be repeatable 6 weeks, 6 months, or 6 years down the road. If a customer comes back to me at a later date wanting a replacement sign, for instance- I need to be able to give them exactly what they got last time. Maybe a customer bought a sign from us and returns to us months later to wrap their vehicle- I want their logo colors to match no matter what we’re printing on. That same customer could come back 2 years later with a fleet of vehicles they want to wrap the same way as their first one. If so, I’ll make that whole fleet match and look great together. So the key for me has always been to make it look great on every type of media, and make it repeatable. I accomplish this by first measuring the ink output of our printer to lay down as much ink as a given media can handle without the ink pooling or running off- the sweet spot. Next, I linearize the printer to ensure that the machine can print gradients evenly from 1% to 100% for each printhead in the machine so the transitions from light to dark areas will look great. Once all of this is done I create the most important color weapon in my arsenal- the ICC profile. I print out a collection of various color swatches, typically a couple hundred, which are then measured with a spectrophotometer- which is a fancy word for a very accurate color scanner. It reads these swatches and measures the way light bounces off of them and turning color into a set of numbers. These measurements for all of the colors I printed become a data set which I compile into the ICC profile. Once I’ve got this profile, my computer knows EXACTLY what colors my printer can produce on this specific media. If I print an image using this profile, the computer will look at the colors in the image and compare it to the colors the printer is physically capable of reproducing. It then will adjust the image to get the very best representation possible on that media. Furthermore, if there are Pantone colors in the document my software will automatically find the nearest scientific match for that color. Cool huh? If you think all of that work sounds tedious, it doesn’t stop there! This profiling process needs to be done for each media, at each resolution. It’s a lot of work, but once it’s done the benefits are huge. My customers just know their prints look awesome, but I know I can deliver that awesomeness again and again at the drop of a hat. Most of our colleagues in the industry don’t employ this technology because of the effort required, but I feel strongly that it sets us apart and allows us to deliver color they can only dream of. Everybody wants a good deal- and why not? We come across customers all the time who are cost-obsessed and focused on getting the lowest price for their signage or their vehicle wrap project. At Precision Signs & Imaging we are more than happy to provide a free estimate and consult with a client about what products/designs would best suit their needs, but we try to steer the conversation away from price. Why? Are we ashamed of our pricing? No way! We feel our prices are incredibly competitive- but that’s not the point. We are happy to compare our prices to our competitors, but we want to make sure it is an apples-to-apples comparison. Not everyone uses the same high-quality 3M vinyl, the same cutting-edge Latex printing technology, or the same experienced professionals we have. Our signs aren’t just designed to look amazing, they are built to last and look amazing for years to come. If some sign shop offers you what appears to be a better deal on your monument sign ask them if it’s weatherproof and designed to withstand high winds, moisture and harsh winters. If someone has a lower price than us on your lightbox design or channel letters just ask them if they offer a 5 year warranty like we do. A guy tells you he can wrap your vehicle for less than us, but does he do it with 3M products using a 3M certified wrap installer? Asking these questions is how you stop focusing on price and start buying signage with value. The value of a sign is how well it does it’s job, not how little you paid for it. Go ahead and compare prices- but consider value. You’ll see that the best deal was really at Precision Signs & Imaging all along. LED signage lets people know, within seconds, about your business and why they should do business with you. When you think of electronic message boards, you probably picture the old boards that were only used to notify passersby of the date, time, and temperature (only if it got fancy, though). However, with the introduction of LED lights, electronic message boards have been brought to a whole new level! Now you can have a vivid, interactive, and easily changeable billboard right outside your office. This is the most common, and my minimum recommendation for scheduled content. Every LED sign should have least some content specifically for, and directed to rush hour traffic. This is typically from 7-9am, and from 4-6pm in most locations. You want to schedule messages that talk directly to these drivers. Do some research, and try to determine the demographics of these drivers. Where are most of them traveling too? Tech jobs? Manufacturing jobs? Tailor your content accordingly, talk to the techies, talk to the skilled factory workers, what is important to them? How fast are they traveling? If you have a consistent “stop and go” situation near your sign, take advantage of that time, and modify the play length, or quantity of the content accordingly. If you have trouble isolating certain groups, you can always go to the one common trait: they are driving. Create content that speaks to them, let them know they can take a break from traffic and pull into your place for coffee and donuts. They can beat the traffic on the way home and join you for happy hour specials. Take some time, and think of some ways you can incorporate their immediate situation, with what your organization has to offer. Lunch time is another consistent time frame you can schedule for. If you’re a restaurant, it’s pretty straightforward, let them know why they should come in NOW! Advertise your lunch specials and the reason they should spend their money with you, instead of the competition. For other businesses, you can still market to this group. These drivers may have some time to stop by your place to do some household shopping, get their hair cut, or attend a midday church service. Remember, it’s not just workers who are out during lunch hours. Are you near any schools, day care, or other youth facility? You may have certain drivers dropping their children off in the morning, or picking them up in the afternoon that drive by your sign. What demographic is picking them up, and dropping them off? Who is riding with the parents? Look into your specific location, and let your sign talk to them during these hours. 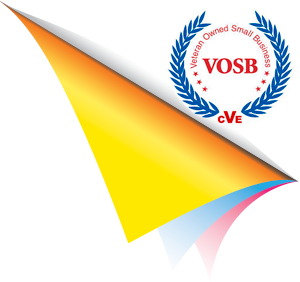 The Small Business Administration (SBA) states that signs are the most effective, least expensive form of advertising for small businesses. In a typical American town, an LED sign’s cost per 1,000 impressions is as little as 15 cents — compared to over 22 dollars for television. 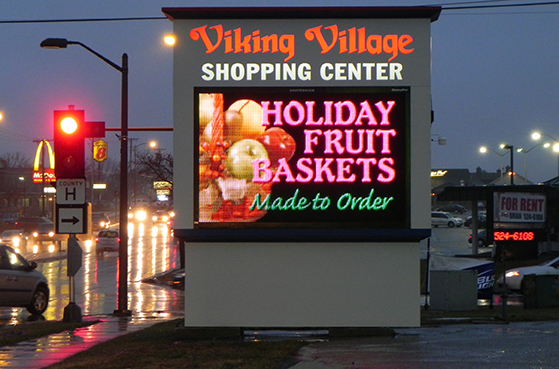 Many businesses can even reduce their advertising budgets for other mediums because their LED sign is so effective. Now that you’ve seen the proof that LED signage work and know how to use them to capitalize on your marketing budget, it’s time to call Precision Signs and Imaging to get your LED sign. You’ll be bringing the latest technology to your business!